A.W. 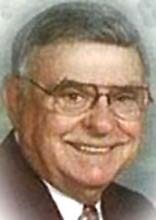 "Ish" Breitbach, 83, of Gilbertville, died Sunday Dec. 31, 2006 at Manor Care from complications of lung cancer. He was born Nov. 25 1923 in Dubuque County the son of Jacob and Anna Hosch Breitbach. He married Bernice Kettman on Aug. 21, 1947, in Gilbertville. Mr. Breitbach was a graduate of Peosta High School. He attended Loras College and the School of Banking in Madison WI. He was employed as President of the Gilbertville Savings Bank for 40 years retiring in 1985. He was a veteran of WWII serving in the United States Navy/Marines in the Pacific Theater and also involved in the battle of Iwo Jima. He was a member of Immaculate Conception Catholic Church Catholic Order of Foresters 4th Degree Knights of Columbus Elks Club and Charter member of the American Legion Nugent-Demuth Post 714. Survived by his wife of Gilbertville; five sons: Fredrick, Loras (Karen), Galen (Pete), John (Trudy), all of Gilbertville, James A. (Marcie), of La Porte City. A daughter, Paula A. Breitbach of Evansdale; eight grandchildren: Christopher, Abigail, Klayton, Tanner, Carter, Curtis, Rayna, Jaicob, and Breitbach; and a brother, Bernard "B.P." of Gilbertville. Preceded in death by his parents; two brothers, Rev. John A. and Joseph Breitbach; two sisters, Mary (Jack) Franta, and Catherine Breitbach. Services: 10:30 a.m. Thursday at Immaculate Conception Church with burial in St. Marys cemetery both in Gilbertville. Full military rites will be conducted by American Legion Nugent Demuth Post 714. Public visitation from 4-8 p.m. Wednesday at Hagarty-Waychoff-Grarup Funeral Service on South St. where there will be a 4 p.m Catholic Order of Foresters rosary and 7 p.m 4th Degree Knights of Columbus rosary. Visitation also one hour prior at the church on Thursday. In leiu of flowers memorials may be directed to the church or the Bosco System.